At the time of my last post I was in the midst of my trip to Quebec City to participate in the 49th International Congress on the Eucharist. By last Friday we had just concluded the pre-congress symposium at which I gave an address. In case you missed my last week’s post, you can read the text of my talk here. On Saturday, we went to have Mass at the motherhouse of the St. Jeanne d’Arc Sisters, the Sisters of St. Joan of Arc. 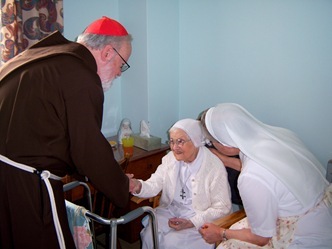 There are 106 nuns living at the motherhouse and the Mass was concelebrated by a number of missionaries, including a bishop from Santo Domingo. 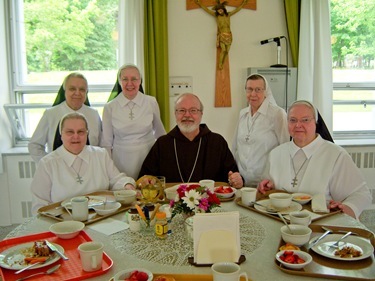 After the Mass, we had lunch with the sisters. 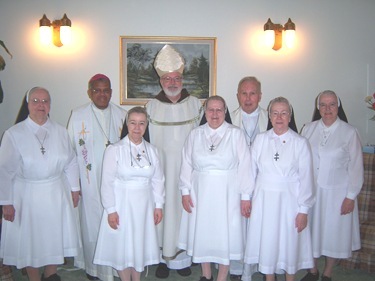 The sisters worked for many, many years in the archbishop’s residence and in the chancery in Boston. 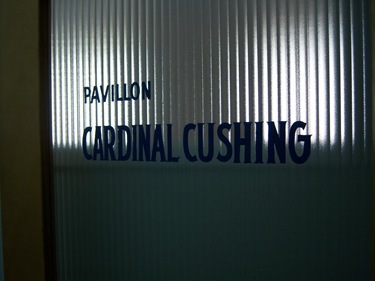 Cardinal Richard Cushing was a great supporter and benefactor of the community. They also worked in St. Anselm’s Abbey in Manchester, N.H. They were also with me for 10 years in Fall River, so I was very happy to be able to go and celebrate Mass (in French, of course) for their community. 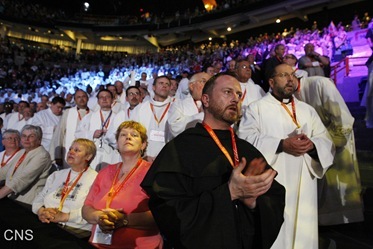 They live very contemplative lives, praying for priests, for the Church. They offer daily holy hours for priests, and I used to enjoy being a part of their holy hour every Thursday night at 11 p.m. 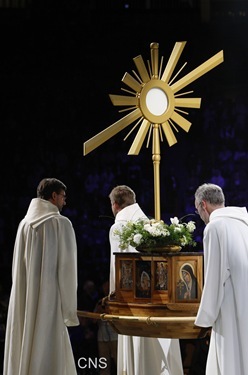 The following day was the opening of the Eucharistic Congress in Quebec City. Quebec is a walled city and is celebrating its 400th anniversary this year, and the Eucharistic Congress is part of those celebrations. The events are taking place at the Colisée Pepsi. 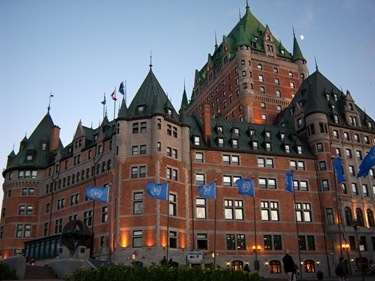 We stayed in the Château Frontenac, which is a very historic hotel in the old city and located near the cathedral. Many of the great “glitterati” of the 20th century stayed in that hotel. As a matter of fact, Winston Churchill and Franklin D. Roosevelt met there and planned the Normandy invasion in that hotel, and there is a monument to that in the hotel today. At the opening ceremony there were a number of talks. First of all, the Cardinal Archbishop of Quebec, Cardinal Marc Ouellet, gave an address and welcomed everyone. 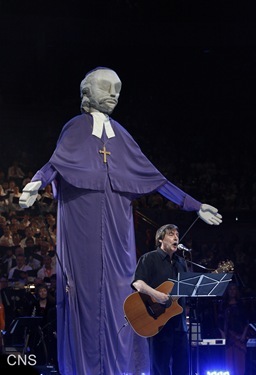 During the ceremony, they brought in large figures representing the different saints from Quebec. I suppose you could describe them as something like big puppets. There have been so many saints in the history of Quebec, beginning with the first bishop, Blessed François Montmorency de Laval., whom the university where the congress was held was named after. I was very impressed by the individuals from the government who spoke at the opening ceremony with such eloquence about the Church with obvious affection and respect. First to speak was the mayor of Quebec City, Régis Labeaume, and the Quebec Minister of International Relations and Francophone Affairs, Monique Gagnon-Tramble gave a beautiful address bringing in much of the history of the Church and the contribution that the Church has made. Then, the Minister of Canadian Heritage Josée Verner spoke beautifully about the faith, and he said the most multicultural group in Canada is the Catholic Church. 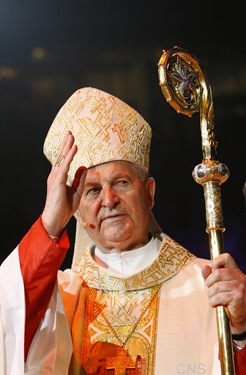 The conference’s papal legate was Cardinal Jozef Tomko from Slovakia. 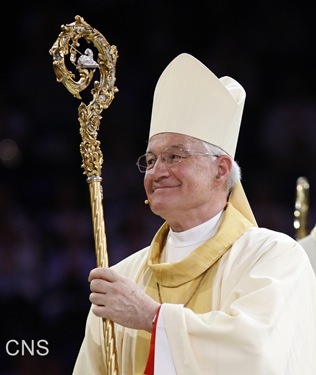 He recently retired from his post as President of International Eucharistic Congresses. He did a wonderful job representing the Holy Father. He was a very good choice to send because of his great involvement in the Catholic missions. 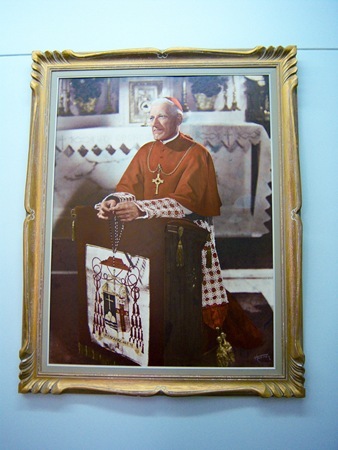 For many years he had been the Prefect of Evangelization of Peoples at the Holy See. In fact, Quebec — like Ireland and Belgium — has been a region that sent huge numbers of missionaries throughout the world. The cardinal presided and preached at the opening liturgy, at which time he said to Cardinal of Paris, “I’m 84, not 23.” The Paris cardinal’s name is André Vingt-Trois, and “vingt-trois” in French means 23. 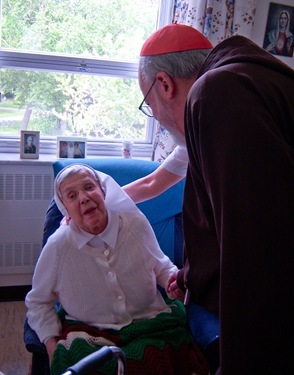 And, of course, Cardinal Tomko is 84. I knew Cardinal Tomko from when I was bishop in the West Indies. He named me visitator for some of the seminaries in the area. It was wonderful to see him. Later there was a sort of cultural show by Gen Rosso, a performing arts group from the Focolare youth. After which the Gospel books were brought in, carried in on the Ark of the Covenant. In order to prepare for the congress, the ark had been circulated through all the dioceses of Canada at different youth rallies and so forth. 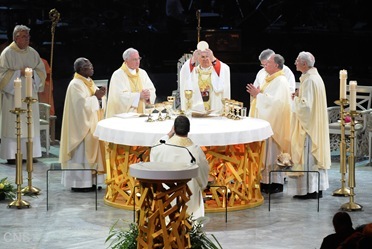 The Mass was concelebrated by 40 cardinals, 106 bishops and assisted by 12,000 people in the coliseum. 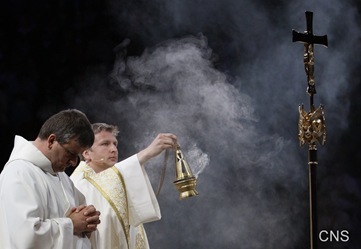 At the end of Mass there was a ceremony wherein a number of cardinals received the Blessed Sacrament to take to seven churches to be used for perpetual adoration during the week. 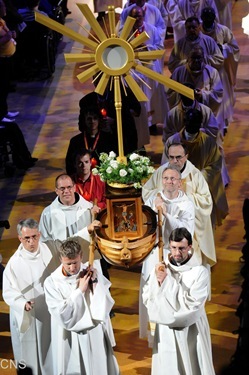 Then, a huge wooden monstrance was placed on top of the ark and carried out by priests. I told Cardinal Ouellet how moved I was at that sight because it reminded me of that passage in the Old Testament when the priests carry the Ark of the Covenant, and when their feet touched the Red Sea, the waters parted. 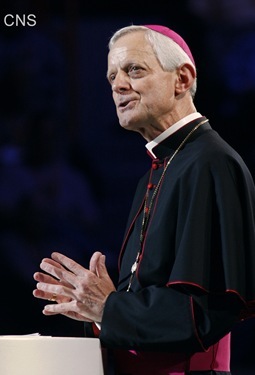 At the conference the following day, Archbishop Donald Wuerl of Washington D.C. gave the first talk. 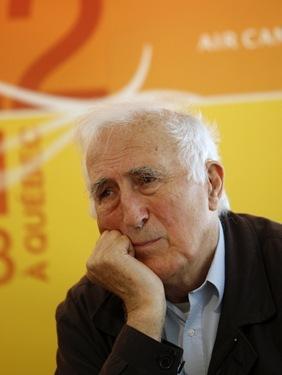 The second talk was given by Jean Vanier, founder of L’Arche Communities. 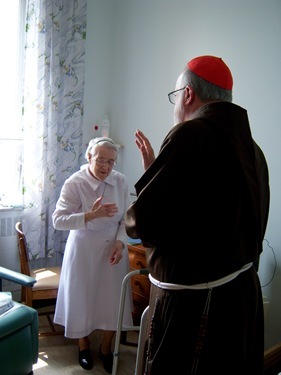 His father had been the governor general of Canada, and Jean Vanier represents those wonderful Catholic Quebecois families who were so dedicated to the mission of the Church. He gave a beautiful testimony about Christ’s presence among the poor. The talk reminded me of Sen. Sam Brownback’s address to our lawyers at the Red Mass here in Boston last year. He said that 90 percent of babies diagnosed with Down syndrome while in the womb are being aborted. Jean is a man who has dedicated his entire life to serving, living with and forming community with adults with Down syndrome. He said he enjoys their friendship and sees Christ in them. People were very moved by his words. Then, I returned to Boston and on Wednesday I met with Father George Agger, SVD, a missionary in Montserrat, which is a beautiful little island in the West Indies. 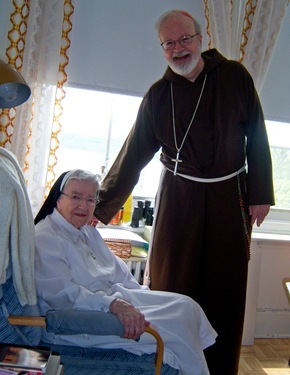 Father Agger came to thank me for the pews and other church furnishings that we are sending from Boston to Montserrat where two of the three churches were destroyed by volcanic eruptions there. In fact, volcanic activity is very intense in the island. Recently, they evacuated the entire area for awhile, and now about 5,000 people have gone back. 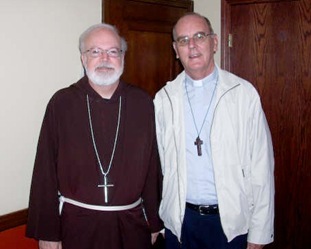 I was very happy that we were able to use some of our religious patrimony to support the Catholics of Montserrat. 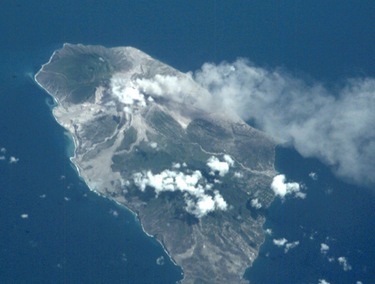 An aerial view of Montserrat. When I was bishop in the West Indies, we would often have meetings there on Montserrat. It was one of my favorite islands for many reasons. Historically, it is the island where many of the Irish indentured servants and slaves settled. They intermarried with the freed African slaves, so most of the people on the island are black with Irish names. 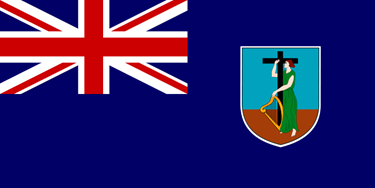 The national flag and coat of arms of Montserrat depicts a woman holding cross and an Irish harp and other flags you see flying everywhere have a big shamrock. They also have a St. Patrick’s Church. Montserrat is one of those unspoiled islands with a lovely sense of community. There is little to no crime, and the people are so friendly. If you go down the street, everyone will wave to you from the houses. Also on Wednesday, we had a meeting in Dracut about the charism of the diocesan priesthood. Father John MacInnis, Father Joe Fagan and Father Bob Blaney and I all gave reflections, and then we had a table discussion. It was very interesting, particularly talking about the charism and spirituality of diocesan priests. There was a wonderful cross-section of priests of all ages from throughout the diocese present. I am very grateful to Father Bob Connors for organizing this. I attended the first meeting of the newly formed Religious Education Committee that will be studying the different books and materials that are being used in the schools and in religious education programs in the diocese as well as family religious education. We hope that through looking at all of this, we will be able to determine what programs and texts have been the most effective in communicating the faith. It is an ambitious undertaking, but we have a wonderful group of people assembled to work on this task. And finally, I want to make mention of an event that took place earlier this month but I had been waiting for some photos to arrive. On Sunday, June 8, I went to Lakeville for a Mass at Sts. 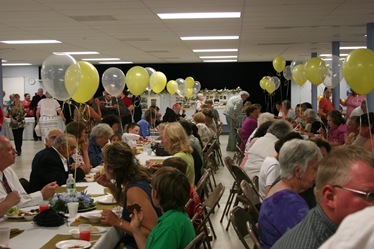 Martha and Mary Parish, where they were celebrating their 50th anniversary. It is a lovely spot right across the street from one of the lakes. Father Francis Daley, the pastor there, is doing a wonderful job. 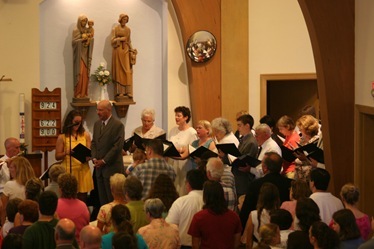 The parish has an outstanding choir, which parishioners are very proud of. I was absolutely amazed by them. The music was magnificent. 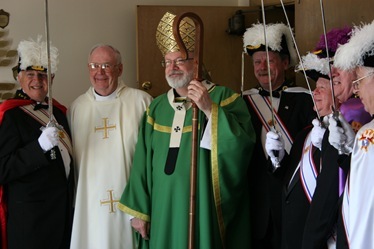 Congratulations to Father Daley and the parish as they mark this important milestone!